Starting and finishing in Vancouver, this 16-day circle route highlights the diversity of British Columbia, from the Coast Mountains to the ranchlands of the Cariboo and the spectacular Discovery Coast Passage. 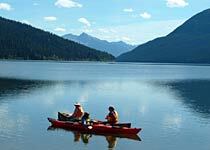 With the flexibility of a rental vehicle you will visit fascinating areas of British Columbia's Heartland. A visit to Whistler is followed by the resort community of 100 Mile House, with a choice of activity from horseback riding, hiking or a relaxing massage. The heart of the Cariboo beckons as you travel to Williams Lake on your way to Nimpo Lake, where you also have the choice between horseback riding or fishing. Leaving Nimpo Lake travel further into the isolated wilderness paradise to Bella Coola at the head of an ocean fjord. A spectacular ferry ride takes you to Port Hardy on Vancouver Island for a one-night stay before continuing on to Quadra Island with admission to Kwagiulth Museum and Cultural Centre included. 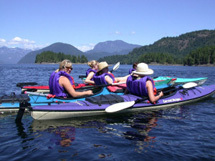 Ferry back to the Sunshine Coast on the last leg of your journey, and enjoy a guided sea kayaking trip. Vancouver will welcome you back to end your journey. Arrive in Vancouver and collect your rental car for your journey to Whistler. 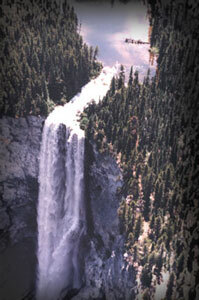 A visit to Shannon Falls en route to Whistler on the scenic Sea to Sky Highway is recommended. Journey time to Whistler is approximately three hours without stops. If you are arriving from an international flight or in the late evening, we suggest you overnight in Vancouver prior to commencing your journey. Experience the magic of Whistler, offering stunning scenery, nightlife and a multitude of activities and adventures. Enjoy pleasant strolls on the red brick cobblestones through the pedestrian-only village, which is alive with fun entertainment, fabulous shopping and cozy bistros. 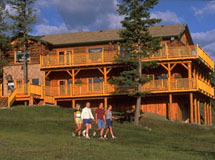 Check-in for your two-night stay at the intimate boutique hotel, Nita Lake Lodge, celebrating its grand opening in January 2007. Overnight at the Nita Lake Lodge. This morning take part in a truly unique experience – a Ziptrek Ecotour. Enjoy an incredible three-hour journey as you hike through the hidden beauty of Fitzsimmons Creek and the picturesque forest valley between Whistler and Blackcomb Mountains, before descending along a series of suspended cables that cross the valley floor. Overnight at the Nita Lake Lodge. Today’s journey is a four and a half-hour drive following Highway 99 past Pemberton and Lillooet to the junction with the Cariboo Highway 97, where you will turn north for your destination, 100 Mile House. This small community dates back to the early pioneer days when it was a rest stop on the fur trade route. Developing over the years into a resort community, this area has much to offer. Overnight at The Hills Health Ranch. Included in your stay is a choice from three activities that include a guided horseback ride, two guided hikes or a full body massage. Your activity can be booked on arrival in 100 Mile House, allowing you the flexibility to choose based on operation, weather conditions and personal preference. The remainder of the day is yours to enjoy at your leisure. Overnight at The Hills Health Ranch. Today’s drive takes you past the town centre of Williams Lake to Tyee Lake. Allow for time to visit Williams Lake and the nature sanctuary on beautiful Scout Island. Perched on the southeast lakeshore, Tyee Lake Resort is situated amidst a vast network of trails and the clean, clear water of the lake. Overnight at Tyee Lake Resort. Available at your leisure are canoes, kayaks and electric motorboats for exploring the eight kilometres of outstretched lake. 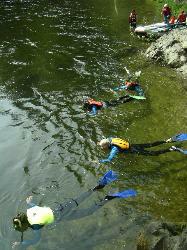 Paddle or cruise to the ‘fish tank’ at the far east end of the lake or simply explore the shoreline. The remote location and shallow bottom provides an excellent opportunity to view both surface and subsurface wildlife such as Great Blue Heron, Sandhill Crane, beavers, otters and a variety of freshwater fish. Overnight at Tyee Lake Resort. Soak in the scenery on your five and a half-hour drive to The Dean on Nimpo Lake. 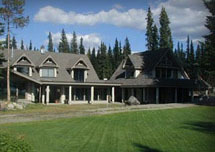 Leave Tyee Lake Resort and head south on the Cariboo Highway 97 before traveling west on Highway 20. At the Dean on Nimpo you can watch a lake awaken at dawn to a perfect day, tease the trout, tantalize your taste buds and enjoy the sensational sunsets. Offering an eclectic mix of the seasoned wilderness and elegant modern, The Dean on Nimpo will not disappoint. Overnight at The Dean on Nimpo. Today you will have the option between horseback riding and lake fishing for one of Nimpo Lake’s wild rainbow trout. Overnight at The Dean on Nimpo. Continue west on Highway 20 to Bella Coola, an isolated wilderness paradise. 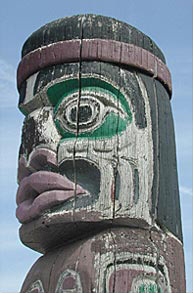 The Bella Coola Native people were the first occupants of this region. Bella Coola presents nature at its finest, virtually unspoiled by man. Overnight at the Brockton House Inn. This morning you will have a choice between two exciting activities, which highlight this spectacular region - snorkeling with salmon (15 Jul - 01 Sep) or river drifting (15 May - 15 Oct). Overnight at Brockton House Inn. Reservations are required and not included in this package for passenger and vehicle travel along the Discovery Coast Passage between Bella Coola to Port Hardy. Discovery Coast Passage services, schedule and reservations are available at www.bcferries.com. You must check-in at least one hour prior to your scheduled sailing time. 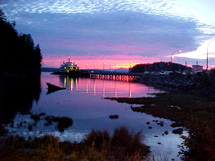 On arrival in Port Hardy continue to your overnight accommodation at the Quarterdeck Inn and Marina. Follow Highway 19 south to Campbell River for a short ferry ride to Quadra Island, the largest and most populated of the Discovery Islands. Nestled between Vancouver Island and the mainland of British Columbia, Quadra Island is best known for its natural and beautiful wilderness scenery. Tsa-Kwa-Luten Lodge, where you will be staying for two nights, in an ocean view room, offers privacy and seclusion within a 1,100 acre forest. Overnight at the Tsa-Kwa-Luten Lodge. Included in your Quadra Island stay is admission to Kwagiulth Museum and Cultural Centre. Eighty-five years after the mask, head dresses and other objects were confiscated by the Canadian government, as a result of a law banning the Potlatch, a major portion of the Potlatch Collection has been returned and is now available for viewing. Overnight at the Tsa-Kwa-Luten Lodge. From Quadra Island return to Campbell River and journey southbound on Highway 19 to Little River for your ferry to Powell River. Head south towards Saltery Bay for your ferry to Earls Cove. Egmont is only a short drive from here on the Sunshine Coast. Relax and unwind during your two-nights stay at the West Coast Wilderness Lodge, tucked away amongst majestic cedars and firs and featuring spectacular views of the Pacific Coast. Overnight at the West Coast Wilderness Lodge. Explore the waters with a guided kayaking adventure, included during your vacation. The area surrounding the lodge is a pool of oceanic and terrestrial life and everyday as the tide floods and ebbs, the scenery and wildlife changes making each kayaking trip unlike any other. Overnight at the West Coast Wilderness Lodge. Travel back by car along Provincial 101 to Langdale Bay for the ferry to Horseshoe Bay. Your expedition ends on arrival in Vancouver with the return of your rental car. Journey time to downtown Vancouver is four hours.